This was my Monday MidDay column today January 8. Some problem accessing the site as I post this, so I don't know if it is on there. Here's the text as I sent it out (it's been changed slightly as published). Your thoughts welcome. The New Year, I'm told, is a time for joy and the renewal of hope. That sort of sentiment. No need to spell it out, I'm sure. Now I'm no kind of grouch, and I'm all for joy, certainly quite intent on renewing hope, and generally in favour of that sort of sentiment. Not even necessarily just when a year turns over. Then things happen that leave me dejected, far indeed from hopeful. Gudhi Padva is our real New Year! Don't send New Year's greetings on the night of December 31 or on January 1. Celebrating the New Year on Gudhi Padva means boosting and developing pride in our religion, culture and language. I'm reading this and thinking: I have no problem with anyone wanting to celebrate the New Year on any day they choose. And Gudhi Padva is a delightful time whose colour and optimism always cheers me. There's something endearing about the "gudhi" itself, the long pole with the flowing scarf and a pot on the end. Yet what kind of sullen people would say to those who celebrate the spirit of Gudhi Padva, don't greet people on any other days? I mean, why should an ordinary Hindu not go to his neighbour on December 31, or August 23, or indeed any day at all, and say: "Hey friend, I wish you the best in the next twelve months!" And if he does so, should the neighbour refuse to accept those warm wishes because they don't come on "our real New Year"? Because it's only on one day in a year that greetings can be offered? Because if offered on any other day, such greetings cannot increase pride in religion, culture and language? Why do we wish each other well anyway? Because we want to boost and develop some ephemeral pride? Or because we care for family and friends? And if you answer that question as I think you will, does when you wish people matter in the slightest? Tell you the truth, I was startled by how dejected this sign left me. How do I explain to a kid, for example, that some people around us think there is a "real" time, one associated with "pride", to greet others? It depresses me more to imagine these people admonishing their own kids when they say "Happy New Year" on December 31. Of course, you might say that's not much of a reason to feel a slackening of the seasonal joy, and you might be right. So then I heard about something that happened on that same night of December 31. At the Gateway of India, somewhere in the middle of a huge crowd bringing in 2007, under the noses of policemen and even a photographer from this very paper, a few dozen louts assaulted a young woman standing in their midst. They groped her, she screamed, nobody heard her in the general noise, they groped some more, her male friend tried to protect her, the louts pushed him aside, they pulled off her skirt, she fell, they "pounced on her with even more venom" (said the photographer). Ten minutes of this -- think of how long that is if you're terrified and helpless -- before the woman's male friend managed to drag her out and they left. There are photographs of this horror. I hope the louts are found and punished. But there's something more to this than just the effort to find them. Talk to nearly any woman in urban India, and you'll hear from her stories of groping, or being followed, or being threatened. It happens on buses, on trains, in bars, in housing colonies. One woman I know tells me that in the colony where she grew up, every young girl spoke of being fondled by the same older man. Another woman I know was followed by a man in a car who made a U-turn, screeched to a halt behind her, jumped out, came up in the lift with her and got out on the same floor. He gave up only when he heard the unmistakably grownup male voices of her family members through the front door. As an aside: Some reports of the Gateway outrage say that these things happen only in Delhi, so how astonishing it is to find them happening in Mumbai. Yet that's just a convenient impression too many of us Mumbaikars -- male Mumbaikars, mostly -- like to hold on to: that we're somehow better than those Delhi-wallahs. The women know the truth. End of aside. I hear about this over the first few days of 2007 and I'm thinking various confused thoughts. Like, if the crowd had gathered at the Gateway on Gudhi Padva to bring in the New Year then, would that poor young woman have been safe? Like, what might boost our pride in ourselves more: the specific time of year that we greet each other, or an effort to build a climate where women feel secure even if surrounded by men? Like, why not a poster campaign to promote that climate, instead of one that tells us we must not greet each other? Like, which poster campaign is a better tribute to our culture? So right: call me silly, call me a grouch, whatever you like. But this New Year did not start on a good note. Of course I realize I should not say that. This was not the "real" New Year. I have been following your posts for some time. I think your blogs point to very real and important issues in a very realistic way. I sure will keep track of this blog. Wierd, the call to boycott Jan 1 New Year. But let me try to understand their 'angst', before they turn to terrorism, for a change. Nobody here was even aware of a festival called Gudhi Padva or any link it had to any new year, let alone actually wishing anybody for that occasion. For all that warm fuzz about this festival, I dont think Gudhi padva wishes have featured in a big way, or even in a little way, on dcubed. This is the first mention, and its in protest, with a blanket statement for anybody to wish anybody on any of the 365 days. 2. Gateway gathering on Gudhi padva could be safer for women? Perhaps yes? If the padvans had their way, there would probably be no Gateway gathering /revelry at all. Even if there was, I guess it would be strictly gender segregated, with shakha police ensuring everyone is at least 3 ft away from each other, and all singing bhajan- keerthans to usher in the new year. Physical security could probably be ensured in such a scenario, the question is, at this price? its in protest? mr jai, where is protest against gudi padva? please shed light on this. I always advise my friends never to go out on new year eve with girls, and that if you want to party, arrange a party in a House... House party, as we say. The Gateway of India made news, but it wasn't new, and it happens not just in Delhi. similar thing happened in the 2001 new year at Bangalore MG road, where 4 girls were ravaged by a crowd. I don't remember if it was reported or made news. Their shirts were torn and the crowd dispersed only when Police came.. They came out for fresh air from a party in MG road..
What shocked me and still does, is that SO many people can be that pathetic. Can I know why this was not the "new" year as you say when the whole world celebrated it? Anyway, I definitely think that the mob deserves a harsh punishment. and just blew some steam. Some Hindus consider Deepavali to be the start of a year. A Hindu friend and I have had an Xtian acquaintance reject our Deepavali wishes, on the grounds that "its not our festival". This hurt esp. because we merrily wish everybody, and each other!, on Xmas and yet I havent considered this worthy of discussion on a blogspace, until now. as a reactive protest to somebody's obnoxious boycott call. Best New Year/ Gudhi Padva/ any other festive/ wishes to all of you. It's true, this needs clarification from me. For one thing, the sign is obviously directed at Hindus. In any case it actually started with "Hindus, Gudhi Padva is our real New Year ..." ("Hindunon, Gudhi Padva haach aapla khara varshaarambh ..."). Christians who say "its not our festival" to Diwali greetings are as stupid and narrow-minded as anyone else who does similar things. I naively had the impression that the article made that point. I don't understand why my dismay at this sign needs to have been qualified by a previous mention of GP in this space. After all this is the first time I have ever seen such a sign myself. After all there have been other things I have expressed dismay at that I have not previously mentioned in this space. But then I don't understand a lot of comments in this space. Right Dilip, I freely admit I was a little off my trot. ... Re. the previous mention of GP ... None of the following is to do with the boycott call which I deplore. I was trying to take it at a larger level. We are embedded in an environment where HNY rolls off automatically from everyone and every space including this one on Dec31-Jan1. GP does not occupy anything close to that mindshare, *apparently even in your mind* (I assumed abt you but I include myself in this set). If there are ppl elsewhere that natively are GP-attuned and look at HNY with *that share of mindspace* do we not see similarities between these 2 groups of ppl, me & them, the difference only being the specific occasions we are tuned to? Actually I struggle with whether we should or should not take offence. In this context, I recall on a blog by somebody else ( lets call him KVik2 Sequester) a post something like "No Salaams in Dar-Es-Salaam" about how he was offended on not receiving the local greeting (~a salaam for this story) but say a handshake instead. You commented thereupon about how somebody refused a handshake and went with a namaste instead. Souza, Dilip D': low. other guy was stupid, end of story. Sequester, KVik2: medium. more deliberation, less enstupidation but close to the same. Chirunti, somebody called: wow. alternative world views, respect for that, did they invade your space etc. This ranking of mine is not to pull any perceived superiority. I find I place myself right alongside you in this test. 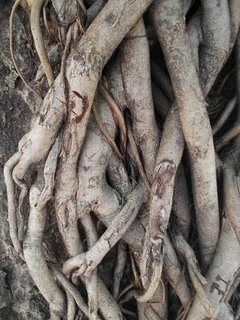 Dilip, roots go deeep, don't they? If they didn't we'd hang from the skies, all of us, and llooking down instead of up as we do now. And, don't advertisements tell us something all the time, so why did this hurt? Because you saw something sinister in it? Something to fear if this were to become a movement? Like what happened in the 1930s? GP does not occupy anything close to that mindshare, *apparently even in your mind*. Also not occupying close to that mindshare in my mind is the Jewish New Year, the Shinto New Year, the Tao New Year, the Chinese New Year, the Karen New Year, the animist New Year, the Bahai New Year, and any number of others out there. I am unable to understand why my desire to wish people who celebrate any of these New Years -- as I have done, whenever I've met such people -- has to be qualified by how much mindshare (whatever that means) I give these events, or by whether I have mentioned these events before. Luckily, those I have wished have simply smiled and wished me back, without asking about mindshare and previous mentions. When they wished me back, it didn't occur to me to say "that isn't my festival." But as I said, I am unable to understand a lot of comments in this space. I take no offence at people not choosing to greet other people. But I think people who refuse to give or take a friendly greeting because "it's not my festival" or "it's not my culture" are, in one word, stupid. In three words, stupid and narrow-minded. Hardly bothers me much, the world is filled with such. Mining what I say here for intent and some perceived ranking is perfectly all right with me. Please go right ahead. As I said, yet again, I don't understand a lot of things in this space. Anil, it boils down to this: I am bewildered that people would find offence, or pride, in something as simple as how we greet each other and when. if the Bahaai or the Jewish are celebrating Jan1 and forgetting their own HNY, I would not find too offensive a perception in some of them of a loss of identity/ culture. (we are away from the boycott call which for the 3rd time, I deplore). Yikes. Really sorry sir. I am unable to fathom if there is any hurt you have mined from my comments that I have not already apologized for. It is of course your prerogative to find them that. I am attempting to be 'understanding' of their world- view. No problem Dilip, my writing must be real pathetic. Thank you Anita. I needed that. So did I. I realize I had my priorities wrong. I AM following the Gateway story and its also all over the news unlike Gudhi Padva, but it certainly doesnt appear so from this discussion. I ve said way too much on GP, and its something I dont have a clue about (am not Marathi) and some extrapolation as well. Just got into a fighting mode. Dilip, I agree with you. It is bewildering indeed. They seek identity in a shared past, in the belief that it will somehow ensure a shared future, and seek to impose it where they cannot propagate it. It's only right that we attach no importance to it, but also respect their views on it, for they may not mean any harm. They're merely making up for the lack of organisation in their religion unlike other organised religions. It gives them some sense of their own worth, that's all there is to it, hopefully.